Infographics are a great way of visualizing data that can otherwise seem abstract. 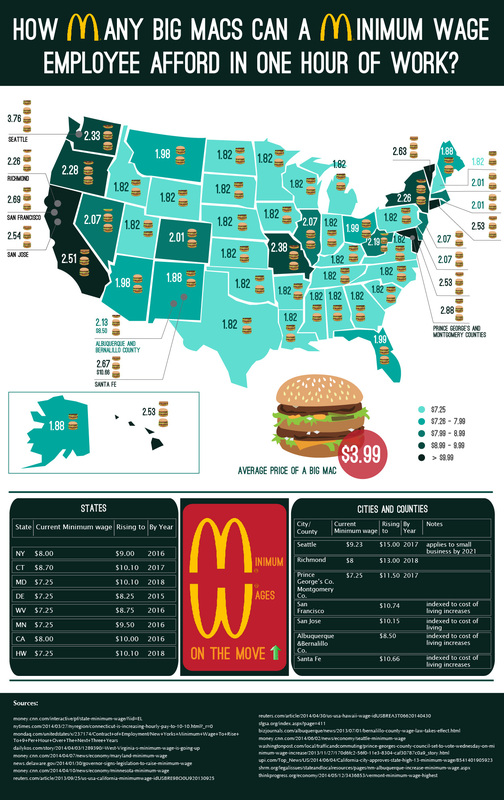 We create a lot of infographics for our clients, but we thought we’d try our hand at one of our own, with the graphic below that shows how many Big Macs a minimum wage worker can afford per hour of work across the United States. The minimum wage is something that a lot of groups have been talking about lately, from politicians to unions and business groups. The city of Seattle reframed the debate when they approved an increase in minimum wage to $15 an hour, double the federal minimum wage, which is currently $7.25 an hour. Cities across the country have been debating a similar increase, including our very own city of Chicago. McDonald’s has been under significant pressure as a major employer of minimum wage workers, though McDonald’s CEO Don Thompson has come out in support of an increase in federal minimum wage to $10.10 an hour. Meanwhile, Big Macs have been used to illustrate relative purchasing power since the conception of the ‘Big Mac Index’, and in this case, these burgers hopefully illustrate the scale of the issue.